Giving Something to Those Who Gave. Veteran Tickets Foundation (Vet Tix) provides FREE event tickets to family members of troops Killed In Action (K.I.A. ), our Military and Veterans to sporting events, concerts, performing arts and family activities. Attending these events reduces stress through entertainment, strengthens family bonds, builds life long memories and encourages service members to stay engaged with American life and local communities. Giving free event tickets is an expression of appreciation, acknowledgement and an enduring symbol that we, as a nation, honor the service of our troops today and long after their tour of duty has passed. Helping our veterans attend events provides positive family and life experiences after their years of service to our country. Jay Katz: Thank you so much for stopping by Eddie. With great humility Eddie, I want to tell you that InvestComics supports Vet Tix and your cause with great respect. Eddie Rausch: Thank you for the kind words Jay. Vet Tix appreciates the support you and InvestComics provides our mission. JK: Why did you decide to start Vet Tix? What compelled you to begin such a tremendous project? ER: It all started at the 2008 Super Bowl. Two of our other Founders were attending (one U.S. Navy Veteran and the other USMC Veteran) and had a buddy that was part of the pre-game color guard. They learned that once the pre-game ended the color guard were not able to stay and watch the Super Bowl…they were escorted out of the stadium. The entire game the seat next to them sat empty. This seat, this ticket could have been donated so that one of the members of the color guard could have enjoyed the game. The idea was born right there. As soon as I was asked my thoughts about it a day later I was “IN”…thought it was an amazing idea. We have been moving full speed ahead ever since. JK: Who has come on board to contribute to Vet Tix so far? ER: If you asking about sports teams then pretty much all of MLB with the exception of 2 teams. Each year we partner with more and more Universities and Bowl Games…last season we distributed tickets to 26 Bowl Games including Fiesta Bowl, Sugar, Bowl, Orange Bowl, Chick-fil-A and AT&T Cotton Bowl. The list really goes on and on including other sports (NBA, NHL, MLS, Minor League Baseball), concerts such as Kenny Chesney, George Strait and a number of music festivals, family events like Disney on Ice and Ringling Brothers, to Broadway plays and even seasonal events like haunted houses and the Polar Express train. If there is a ticket to an event we will accept it and get it distributed to our veterans for use with their families. Later this month we will hit ticket number One Million!! 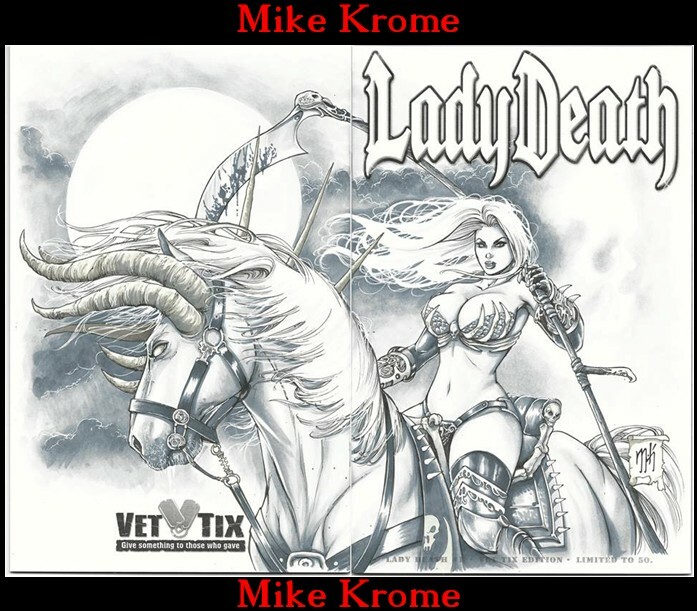 JK: Recently many comic book fans learned about comic book artist Brian Pulido teaming up with Vet Tix. How will Brian contribute? ER: Brian is absolutely awesome in his support of Vet Tix! 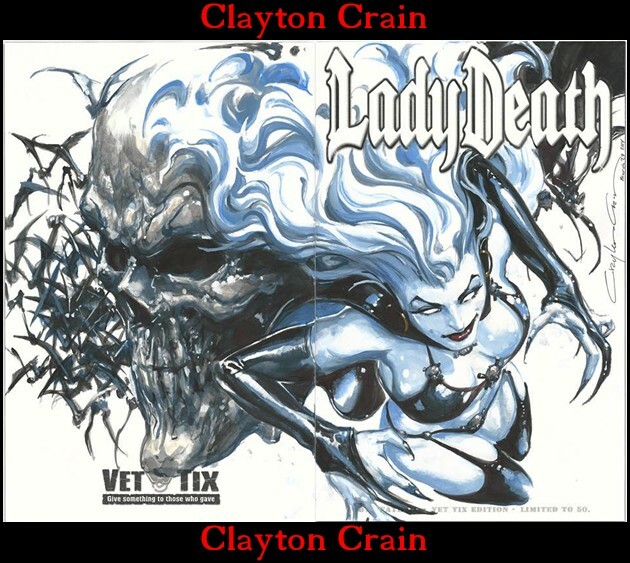 Lady Death is his baby…in all reality she is his daughter and he has allowed Vet Tix to be a special part of her 20th Anniversary. 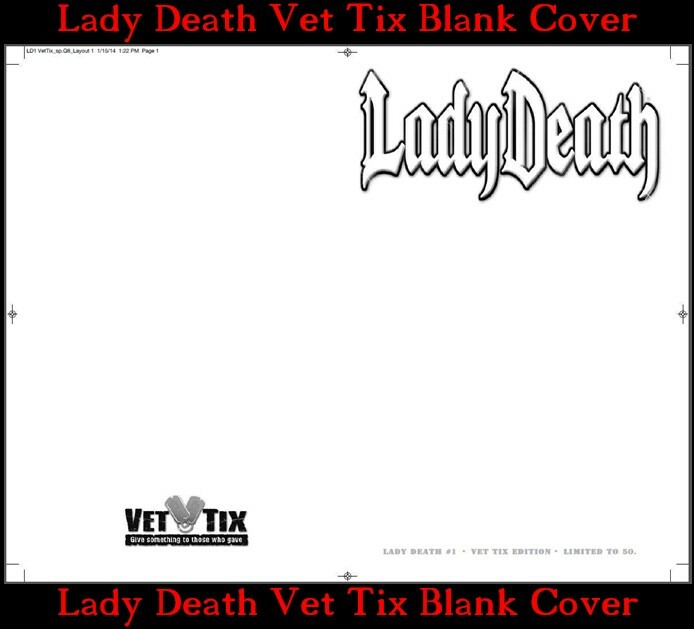 He has given Vet Tix permission to reprint issue #1, the one that started it all, and put a blank cover on it stating this is the “Vet Tix Edition” with our logo on the rear cover. 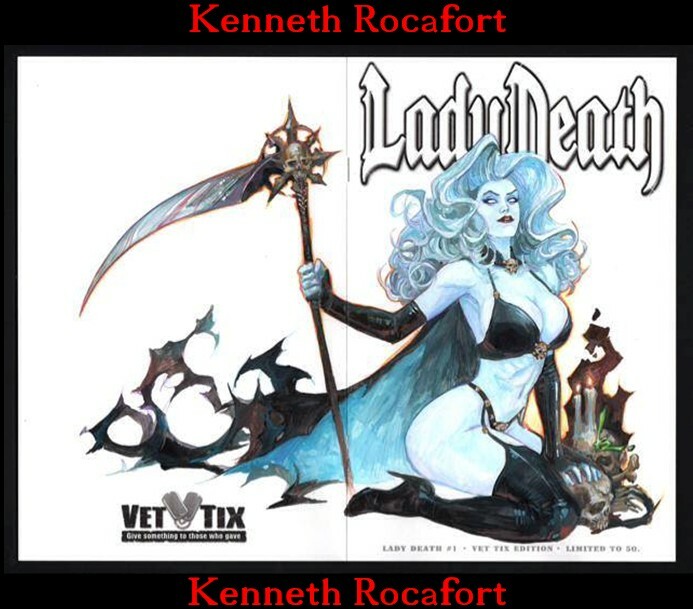 We are now working off of a list put together by Brian and myself to secure artists that will create their vision of Lady Death on these 50 covers. JK: Which creators have come on board so far? Can you share any covers yet or are they still a work in progress? ER: We have a great list going with more to come…names like Marc Silvestri, Whilce Portacio, Brandon Peterson, Frank Cho, Leinil Frances Yu, Jay Anacleto, Philip Tan, Carlo Pagulayan, Clayton Crain, Kenneth Rocafort, Arthur Adams, Ivan Reis, Humberto Ramos, Mark Brooks, Agnes Garbowska, Billy Tucci, Tim Vigil and Peter Steigerwald. We also have some great new artists that are really turning in some amazing work as well. 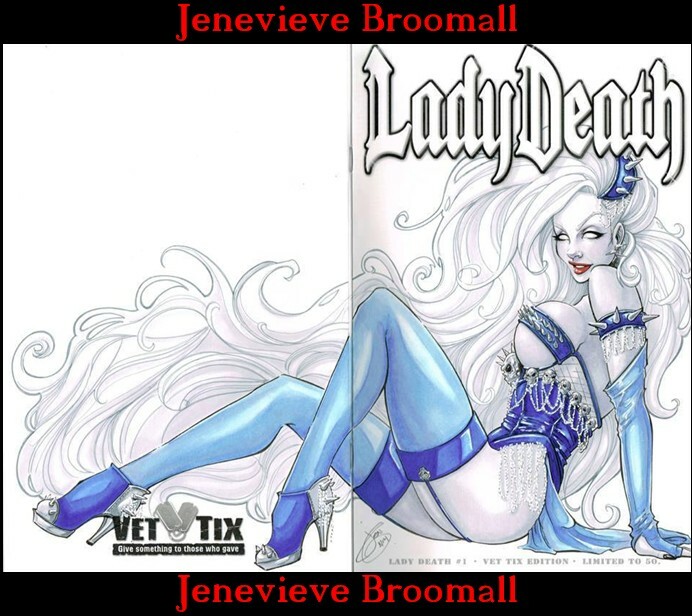 Artists like Sajad Shah, Dawn McTeigue, Siya Oum, Mike Krome, Jesse Winchman, Jenevieve Broomall, Jaime Tyndall, Mike DeBalfo, Jonathan Marks, Jason Metcalf, Conny Valentina, Sarah Giardina, Alan Quah, Thony Silas and Rian Gonzales. I do not evny the fans that will need to choose between all of these covers…they truly are incredible!! JK: Brian Pulido is an extremely approachable creator. Any fan that visits a convention knows this. He’s a tremendous talent. What was Brian’s initial response when you approached him regarding a possible project for Vet Tix? ER: I have known Brian for some time now and for the past few years he has reached out to me/Vet Tix to see how he could support. He has donated back issues to be shipped to our deployed troops and he has started a “Tip Jar” at his table. He will sign all the books a fan wants all he asks is that they donate to the tip jar. These funds at each convention will go to either Vet Tix or Heroes Initiative. 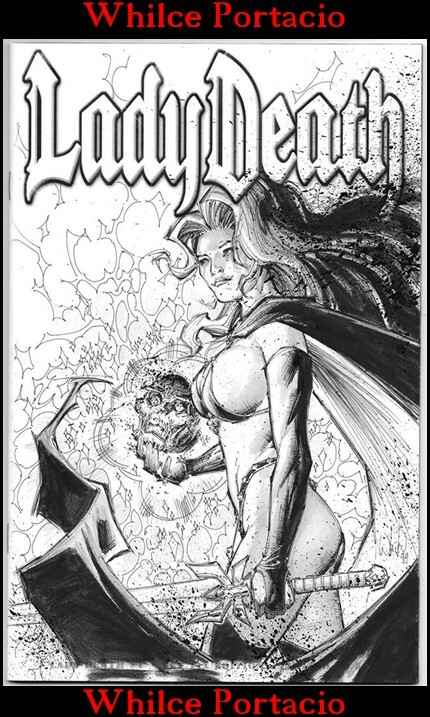 When this idea for a blank cover project came up he thought it was perfect timing to celebrate the 20th Anniversary of Lady Death and loved the idea. As much as this is an AMAZING way for Vet Tix to raise funds and grant “Hero’s Wishes” I think Brian also enjoys seeing how each artist sees his character. 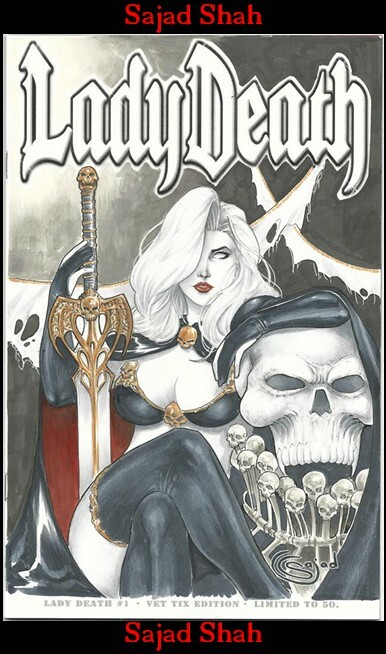 Who knows, maybe we will see more Lady Death from some of these artists now that they have had a chance to draw her and Brian has seen what they can do! JK: Okay so all 50 comics will be CGC Signature Series graded. Besides being completely awesome, how did you get CGC on board too? ER: Things just seem to fall in place with CGC. One of our followers on the Facebook event page has a connection high up with CGC. He reached out to me and suggested I call this contact. I did, explained the project and it was a done deal. I was told to send all the completed covers in at once and to mark them to HIS attention and CGC would make certain this books would be made a priority in turn around time. It helps to have fans that also believe in your mission!! 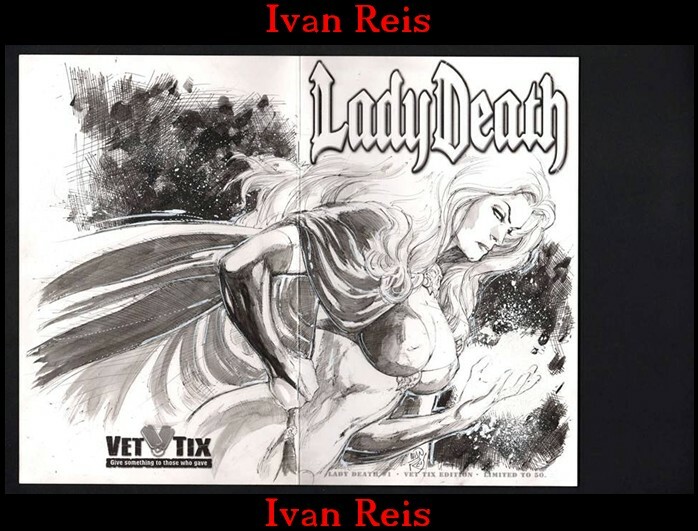 JK: Where can collectors bid on the CGC Lady Death Artist Project once they are done? ER: Vet Tix has an eBay seller’s account. We have gone through the process of being vetted by them so we can auction the items and any fees that would normally be charged are returned to us due to our status as a 501c3 non profit organization. I would suggest anyone interested add “vet-tix” to their favorite sellers list. 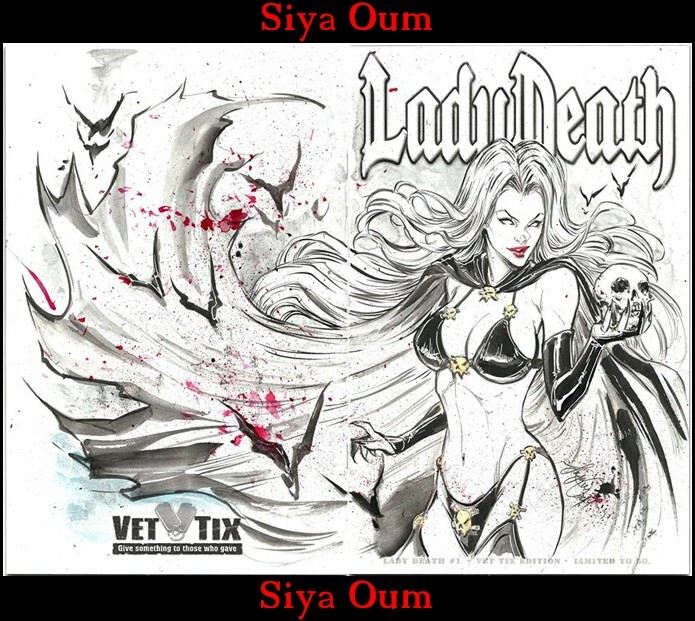 They may also join the event page on Facebook, search Lady Death Artist Project benefiting Vet Tix – Hero’s Wish. On this event page we will post work in progress pics, completed cover pics and add the live links to the eBay auction for each and every cover! 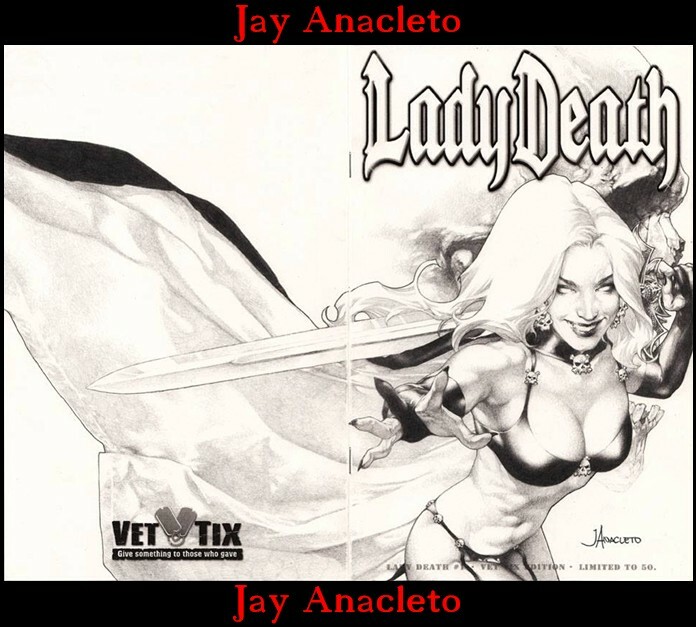 JK: Do you have any other creator projects after Brian Pulido’s Lady Death Project that you can tell us about? ER: WE do!! On the heels of the Lady Death project we will also be doing a similar blank cover project with Billy Tucci for the 20th Anniversary of “Shi, Way of the Warrior”. Our goal is to be able to collect these completed covers and display at either Baltimore or New York Comic Con this fall. There is also an event page on Facebook for this project. JK: Are you a comic book collector?? ER: I did collect comics for a number of years, have long box after long box in my collection. I still do a little now, trying to put together a run of Amazing Spider-Man and X-Men 1-100 together, but in 2008 things changed for me when Michael turner passed away from his long battle with cancer. I realized I collected the comic books for the art and began collecting Original Art from those artist I admire. JK: Please tell everyone where they can go to make a donation, contribute, or become part of the cause. ER: It is simple, go to www.VetTix.org. Here you can donate tickets and/or money, become verified in our system if you have served or are serving in the U.S. Armed Forces or if you are primary next of kin to killed in action and begin making use of the service we provide. JK: Thank you so much for your time Eddie. Your foundation is an amazing tribute to the men and women who serve this great country of ours. It was an honor. Thank you.